When it comes to the memory of toys in the childhood, the skateboard must be the favourite one of boys. When they were young, they would play with the skateboard and went down the street. During the ride, they experienced the high speed for the first time in their life. 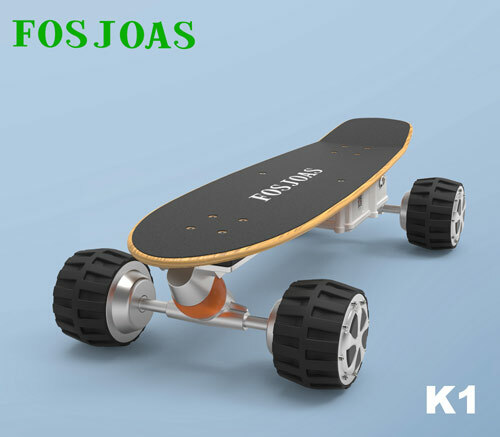 Cherishing the golden memory of the skateboard, Colin online ordered a set of electric skateboard FOSJOAS K1, which is rolled out by Moben Global Inc. Here we will get a better understanding of Colin’s personal experience of riding FOSJOAS K1 self-balancing electric unicycle. The first concern is the speed. Colin rides it and it can runs at the top speed of 18 km/h. This speed can hardly be termed as high to be sure, but it is passable for a skateboard. The excessively high speed is bound to cause danger, especially for those beginners. Out of safety purpose, Moben Global Inc. lays a limit on the speed of K1. The speed of K1 is accepted by Colin. Different from the traditional skateboard, K1 can be controlled via wireless connection. The rider could have the control at hand and manipulate his FOSJOAS electric scooter K1. Via the remote controller, the rider can adjust the high speed. Even if FOSJOAS K1 is 10 metres away from the owner, the owner still can control it. What a powerful wireless connection. Have you thought that the stickers on the skateboard can be changed at will one day? Yes. You can make it on FOSJOAS K1. Moben Global Inc. knows what the young man need and like, providing them with gorgeous stickers if one or another sort. Since a variety of stickers are available for use, Colin usually alters his sticker at will. Therefore, his FOSJOAS K1 cheap electric skateboard always look new. He likes something new and novel and detests something featureless and dreary. Previous：Why Does Fosjoas Twin-wheeled Scooter V2 Have A Large Customer Base All Over The World?